Twenty-eight points, 11 assists and 11 rebounds for the King. LeBron: Lakers are now 2-3 after slow start. 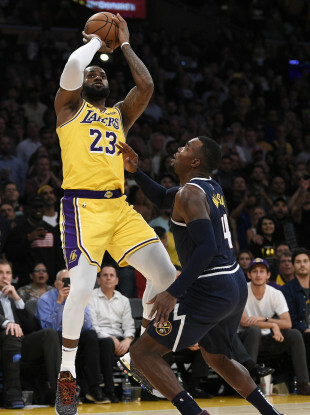 LEBRON JAMES HAD a triple-double in his first home win at Staples Center as the Los Angeles Lakers came from behind to defeat the Denver Nuggets 128-111. James had 28 points, 11 assists and 11 rebounds while leading the Lakers’ late rally against the previously unbeaten Nuggets. “We got stops. They are one of the best offensive teams we have in this league and when you do that you are able to get out and run,” said James, who posted his 74th career triple-double. It was the Lakers’ second win in two days after struggling to an 0-3 start to the season. Lance Stephenson finished with 12 points but more importantly he hit back-to-back three pointers in the fourth to spark a 15-2 run for Los Angeles. Kyle Kuzma scored 22 points and JaVale McGee added 21 in support of James’ triple-double — his first with his new team. With Kobe Bryant watching from the stands for the first time since James’s arrival in Los Angeles, LeBron brought the Staples Center crowd to their feet with a go-ahead dunk with 3:31 to play. Nikola Jokic scored 24 points for the Nuggets, who were off to their best start since the 2009-10 season. The Lakers won despite playing without suspended starters Brandon Ingram and Rajon Rondo. Ingram will miss one more game for his part in the Lakers’ melee with the Houston Rockets last weekend, while Rondo returns Saturday in San Antonio. “We have gotten better through all of our games and we want to try to continue that against San Antonio on Saturday,” said James. Email “LeBron hits triple-double as Lakers come from behind to end Denver's 100% start”. Feedback on “LeBron hits triple-double as Lakers come from behind to end Denver's 100% start”.